This jig can be made quickly and easily, and provides a way to cut lap joints on either table saw or radial arm saw. I made my first jig from a 3/4"x4"x12" baltic birch plywood scrap and it worked quite well. Dimensions aren't particularly important, and there are no calculations or measuring involved. If you use a miter guage with an adjustable metal fence, please remember to double check that the fence will clear the blade(s) you'll be cutting with. Blade: Saw blade or dado stack you'll be using to make the lap joints, fully raised. Set the rip fence to allow you to make a rip cut into the approximate center of the stock. I found that a cut resulting in a kerf approximately 2"/50mm long worked well. Blade: Any blade at normal crosscutting height. I made the cut with a normal blade on another saw. Close to the kerf, mark the stock on one side of the kerf "A1" and the stock on the other side "A2". Make a cross cut so that you have two blocks, A1 and A2. Set these aside while you make the next cut. Using the miter guage, make a cross cut to produce a full width block. The cut length of the block isn't important. I cut this block to be about the same height as blocks A1 and A2. Label this block "B". Position the jig stock against the miter fence, abut blocks A1 and A2 against the stock, and position all three so that you can make a cross cut that will result in a block that you'll be able to hold safely for the next step's cut. With the blocks in this position, set a stop agains block A1 and secure it in position. 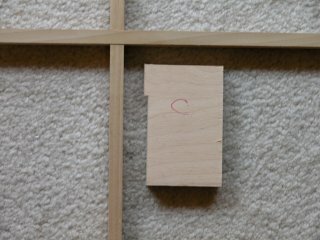 When that's been done, make the cross cut and label the new block "C". Blade:Saw blade or dado stack you'll be using to make the lap joints, fully raised. 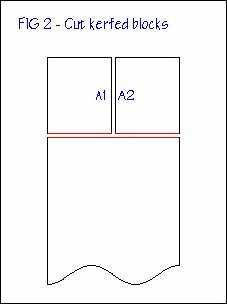 Replace blocks A1 and A2 with block B as shown. 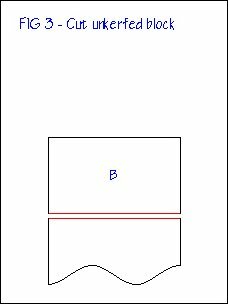 Holding blocks B and C against the stop, make a cut long enough that the uncut "bump" will clear the stop when block C is rotated 180° as shown in Fig. 6. Block C is your new lap joint jig. Take a look at the underside and if the last cut produced splintering, use a knife or chisel to remove the splinters. At this point you can discard blocks A1, A2, and B.
Blade: Saw blade or dado stack, with the height adjusted to half the thickness of the stock (or a tiny bit higher). Line up the jig, a sample piece of the stock you're cutting the recess to receive, and the stock to be cut against the miter fence and position these so that the left edge of the blade/stack lines up with the leftmost part of the recess to be cut. Position and secure a stop against the jig, and make a cross cut. 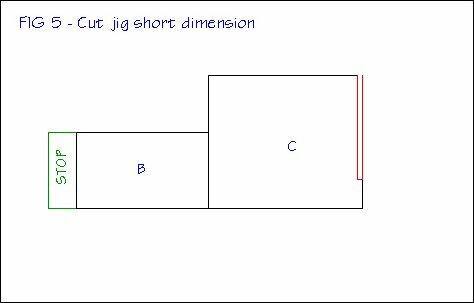 Remove the sample piece and rotate the jig 180° to the position shown in Fig. 7. 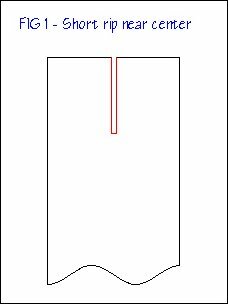 Notice that by removing the sample piece and shifting the workpiece left you moved the cutting point to the right by the width of the sample. When you rotate the jig, the workpiece is shifted right by the width of the kerf, so that the cutting point is moved left by the width of the kerf so the right edge of the blade lines up exactly with the right edge of the recess. 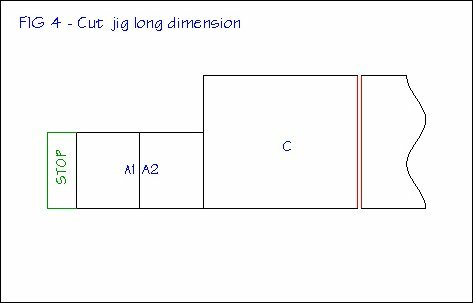 It is this last kerf-width adjustment that you built the jig to handle. Blade: Same blade/stack at the same height. With the stop still in the same position, hold the workpiece and jig firmly against the stop, and make another cross cut. Then, if needed, make additional cutting passes to "clean out" the joint. The mating piece is cut in exactly the same way, except that the sample will be of the same width as the board we just cut.